Roses are very hungry plants and should therefore be fed regularly throughout their lives to ensure maximum blooms and growth, from first year plants through to 50 year old ramblers. 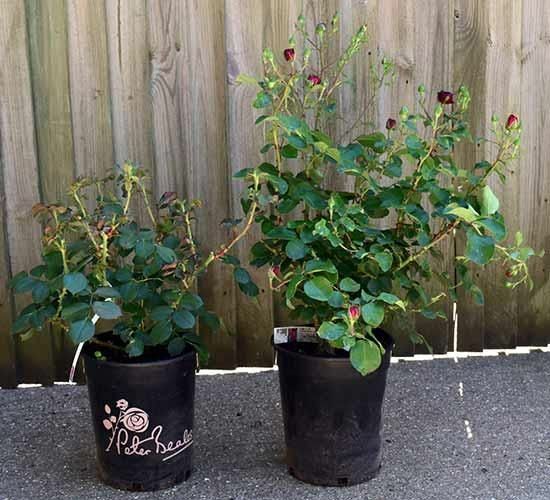 We recommend a good feed of a nitrogen high feed like “Top Rose” after the late-winter prune in February, then feeding every two weeks throughout the flowering period with a high potash feed like “Tomorite” or "Uncle Tom's Rose Tonic". This photo shows just how much difference regular feeding makes. Both ‘Frilly Cuff’ roses were pruned at exactly the same time and to the same height, but the big difference is that one has been fed fortnightly, whereas the other one hasn’t been fed at all. As you can see the plant that received a regular feed is much bigger, healthier and is bursting with buds. Many feeds are available, but the one we would most recommend is Uncle Tom’s Rose Tonic, which we used for this demonstration. Uncle Tom’s Rose Tonic will not only encourage strong healthy growth, but will also increase disease resistance. Tomorite also works well and is one of the cheapest and most readily available. Simply dilute to half the strength recommended on the bottle for Tomatoes. Roses also require regular watering, especially during the summer. It is very hard to over water a rose, but they will not appreciate having their roots sit in cold water for long periods. Roses grown in pots should be given a good water daily throughout the growing season. During the summer newly planted roses will also need watering regularly until their roots are established. As well as putting the plant under stress, insufficient watering can also contribute to the development of rose diseases.